Interest in the VooGlue token sale has been gaining steam since the launch of the pre-sale on January 19th. 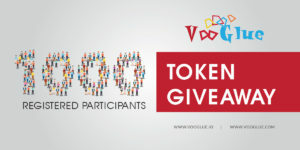 Over 1,000 buyers are now registered at http://vooglue.io/ico/ to be eligible to purchase VGC tokens, with the first million tokens offered at the highest bonus rate steadily selling out. Copy this message and send it to as many people as you know including a CC to pr@vooglue.io. Doing all three of these triples your chances of winning! The deadline to enter the competition is February 23rd and the winner will be randomly selected using http://www.randomresult.com/. Full terms and conditions can be found here. The public sale of VGC tokens will run from March 21st for three months, with tokens being offered at a rate of 500 VGC per 1 ETH. For the pre-sale, however, which runs until March 20th, significant bonuses are offered at a descending rate as tokens are sold. In the first stage of the pre-sale, 1 million VGC tokens are being offered at 80% bonus. This means that by purchasing 1000 VGC (for 2 ETH) you will actually receive 1800 VGC. An additional 10% bonus is applied to any purchase of 5000 VGC or greater. In this case, by purchasing 5000 VGC you will actually receive 9500 VGC. For the second million VGC tokens, the bonus rate is reduced to 70%, the third million to 60%, and so on. Full details of the token sale structure can be found here. You can register to purchase tokens here.